Don’t wait another minute to sign up for South Carolina’s premier women’s road race and walk. 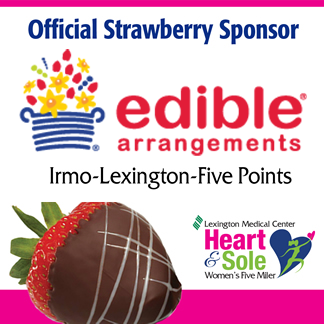 Join us for a fabulous one-of-a-kind experience at the Lexington Medical Center Heart & Sole Women’s Five Miler. We offer the choice of a 5-mile run, a 5-mile walk or a 3-mile walk in beautiful downtown Columbia, South Carolina. Whether you’re an elite runner, a recreational athlete or a first-timer, you’ll love this event that’s designed to call awareness to heart disease, the number one killer of women. When you cross the finish line, you’ll be treated to a beautiful red rose and an awesome medal. Walk over to our expo and enjoy refreshments including Edible Arrangements® chocolate- covered strawberries, free massages and valuable health information. Bring your mothers, daughters and girlfriends and take part in one of the most unique and memorable road race and walk around. We’ll be waiting for you with our arms wide open!